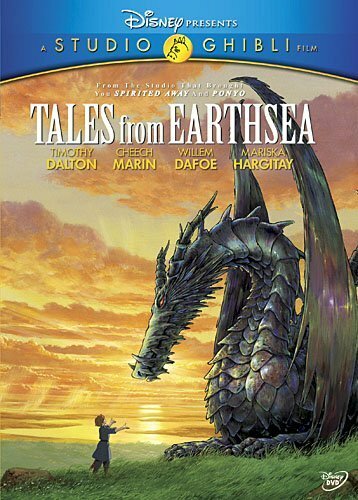 From Disney and Studio Ghibli comes the epic animated adventure Tales from Earthesa, directed by Goro Miyazaki and featuring the voices of Timothy Dalton, Willem Dafoe, Cheech Marin, and Mariska Hargitay.Based on the classic Earthsea fantasy book series by Ursula Le Guin, Tales from Earthsea is set in a mythical world filled with magic and bewitchment. Journey with Lord Archmage Sparrowhawk, a master wizard and Arren, a troubled young prince on a tale of redemption and self discovery as they search for the force behind a mysterious imbalance in the land of Earthsea; crops are dwindling, dragons have reappeared, and humanity is giving way to chaos. Featuing a timeless story and magnificent hand drawn animation, Tales from Earthsea is a must have DVD for every film enthusiast's collection. If you have any questions about this product by Walt Disney Home Entertainment Presents A Studio Ghibli Film, contact us by completing and submitting the form below. If you are looking for a specif part number, please include it with your message.